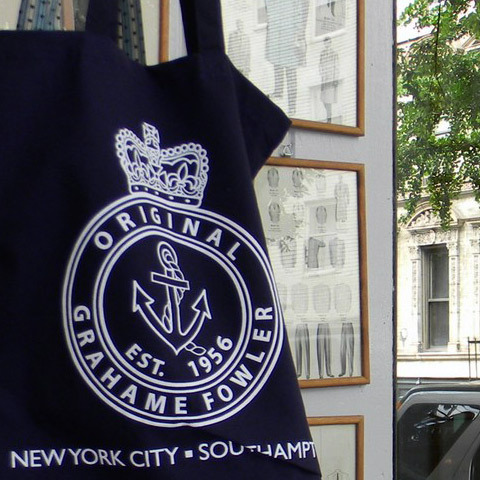 Grahame Fowler is a beautiful collision of classic British aesthetics and locally made New York menswear. The nautical theme that carries throughout the store décor with sailboats and anchors can also be found in the clothing, with tailored, striped shirts and sailor hats. Fabrics from England, Italy and Japan make up the button-downs, suits and knitwear that fill the store. And if Fowler’s high quality apparel doesn’t have you distracted, maybe you’ll notice the white Italian scooter inside the store that is longing to hit the West Village streets—as he is also a collector and restorer of vintage scooters. Casual menswear with a touch of Britain, created by Graham Fowler.